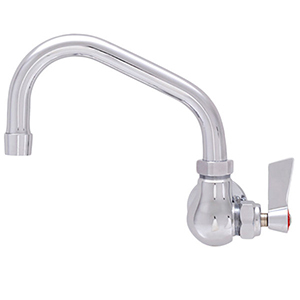 Chicago Faucets Single Hole Wall Mounted Fittings are great for single supply cold or hot water lines. Fill glasses, pots and pans with Chicago Faucets single wall valves. Danze single hole wall mounted kitchen faucets are available in decorative finishes including stainless steel, polished chrome, bronze, antique copper and more. 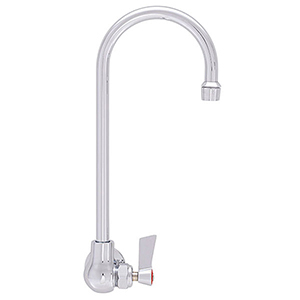 Fisher manufacturers commercial style wall mounted kitchen faucets for use in heavy traffic kitchens. These single supply wall valves can be used for glass fillers, pot fillers and stove ranges. 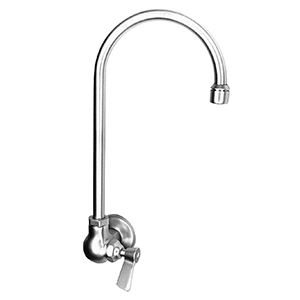 Krowne commercial pot and kettle filler faucets are great for restaurants, bars and busy kitchens. KWC wall mounted pot filler kitchen faucets are designed for the contemporary kitchen, available in stainless steel and chrome finishes. T&S Brass single hole commercial wall mounted kitchen faucets for restaurants, bars and homes. Commercial style wall pot fillers and wall valves from T&S Brass are high quality and designed to last.